Eurovudas Rumus 45 Log Cabin: The Eurovudas Rumus 45 Log Cabin is 4m x 5m where as its smaller sibling cabin, the Dowson 1 is 3m x 4m. These buildings are designed with two solid walls i.e. no glass such that it can be built in a corner of the garden to create a large yet unobtrusive room in the corner. The whole building can be built in mirror image to the way that it is shown so that it will go into either corner of the garden. 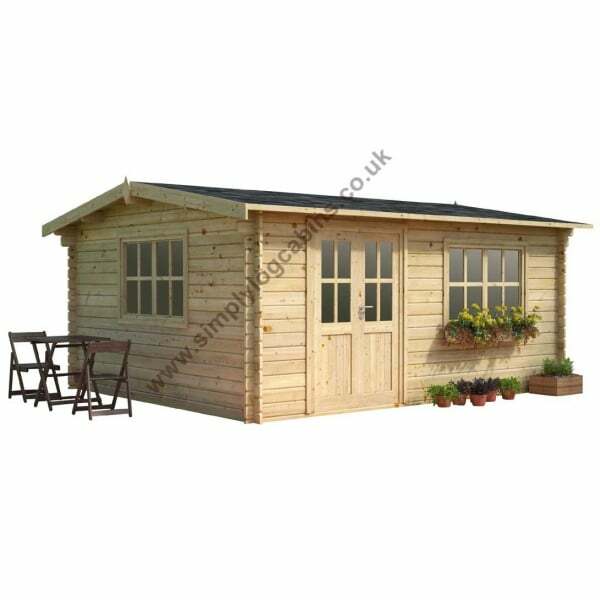 Featuring a shallow pitch on the roof so that we can maintain the headroom clearance but keep ridge height as low as possible this wooden garden building is a classically shaped garden office or similar. With the addition of our optional roof insulation and roofing materials and a little heat this building is simply ideal to use throughout the year. Many customers choose to use this style of log cabin as a hobby room, a work room, a home gym, children’s playroom or many other purposes.